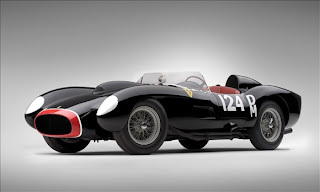 This 1957 Ferrari 250 Testa Rossa once again blew away the competition, setting a world record for cars sold at auction when it fetched an eye-popping $12.1 million on Sunday, May 17, at the Leggenda e Passione, an event held on the sacred grounds of the Ferrari factory in Maranello, Italy. The Testa Rossa, chassis No. 0714TR, was the first of only 22 that were built. In its debut in competition it finished fourth at the Buenos Aires 1,000-kilometer race in 1958. 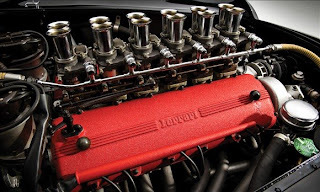 More success followed as the Scaglietti designed speedsters went on to win 10 of the 19 international races they entered from 1959 to 1961. The Testa Rossa, which translates to "red head" in Italian, beat the price set by another Ferrari, the 1961 250 GT SWB California Spider. That car was formerly owned by actor James Coburn and fetched $10.9 million last year. And don't just take my word for it. P. J. O'Rourke recently wrote in the weekend edition of "The Wall Street Journal" that the automobile has "ceased to be an object of desire and equipment for adventure and has turned into office, rec room, communications hub, breakfast nook and recycling bin -- a motorized cup holder. Americans, the richest people on earth, are currently stuck in the confines of their crossover SUVs, squeezed into less space than tech-support call-center employees in a Mumbai cubicle farm. I don't believe the pointy-head bureaucrats give a damn about climate change or gas mileage, much less about whether I survive a head-on with one of their tax-sucking mass-transit projects. All they want is to make me hate my car. How proud and handsome would Bucephalas look, or Traveler or Rachel Alexandra, with seat and shoulder belts, air bags, 5-mph bumpers and a maze of pollution control equipment under the tail?" Well stated, Mr. O'Roarke. Virtually every automobile manufactured today is nothing more than tifosi tofu. Long live the Ferrari Testa Rosa, the Pontiac GTO, the Bugatti Veyron, the Shelby Mustang GT500, the Jaguar XK55 and all others who have the temerity to defy cup holders and idiot lights.